This is sooooo insanely simple there’s a good chance you won’t do it. If you want to become a Huffington Post blogger here’s ALL you need to do (script that you can copy, paste, tweak included). I’ve done it and helped at least 100 other women get published by following these exact steps. No I can’t promise you’ll get a yes if you do this but you definitely won’t get one if you don’t. Set a timer for 10 minutes and just do it. Here’s exactly what I did…and what I want you to do too! 1. I wrote my email directly to Arianna at Arianna@HuffingtonPost.com (She gave her email publicly to an audience at a lecture so it’s totally okay to email it directly). 3. I attached an OLD blog post, in a Word Doc, that I wrote last month (you don’t even need to submit new content so there’s zero reason this can’t be done today). 4. Pushed send and crossed my fingers. I got the green light about three days later with an email from Arianna herself saying she’d love to have me. I sent over my bio, photo and article to her assistant editor and the rest is history…and it took me all of 12 minutes to get it done. 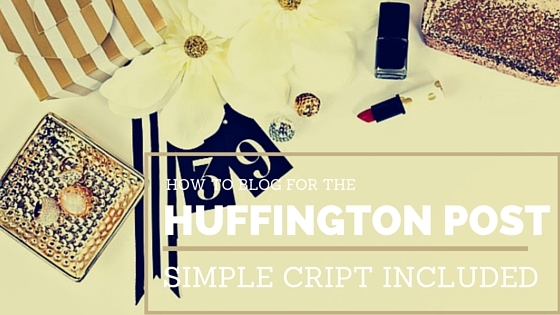 Being a blogger for The Huffington Post gives you major credibility and it’s something you can leverage in your favor to even bigger opportunities. Now will you go do it? Let me know in the comments below! P.S. Once you get the green light, you can upload articles whenever you’d like. Pretty cool. Here’s my author page if you want to take a looksie. P.P.S If you found this useful make sure to click the share buttons underneath this post! I did it! I got a response in 2 1/2 hours this morning. Now just waiting on my link to upload. Carla, you are awesome!! I followed this exact system and got published on HuffPo! Carla’s steps really work! One thing I’ll add is to make sure to follow up. Everyone is super busy so if you don’t hear back, it’s not necessarily a “no.” I got a “yes” back from Arianna who passed it on to an editor, and I had to check in with him 2-3 times before we finally got my post up on the site. So don’t be afraid to follow up after a few days to keep the ball moving! This is awesome Carla! Do you think it’s worth looking into if they publish the kind of stuff I write about. Or just go for it? Thanks for all your help! Thanks for the helpful (and easy) tip, Carla! Definitely putting this on the to-do list! So simple and so amazing! Thanks so much for sharing this great resource and inspiration to just do it. I’d love to get this going! Thanks for sharing Carla!! I will do it to! Could be an awesome way to get new eyes on my stuff! Hi! Do you think her email still works even though she doesn’t work there anymore? Thanks!